Tattoos are permanent reminders of temporary feelings – at least if you believe the report in Thursday's Daily Mail, which looked at "embarrassing" matching couple tattoos – designs that complement or complete each other across two, romantically involved bodies. Yet there are millions of people who feel no embarrassment about the tattoos they share with their friends, lovers and even exes. Moreover, as with most perceived "new trends" in tattooing, this practice is one with a history far older than the current generation; it's a phenomenon that provides both an insight into human beings' fundamental relationships with their own bodies and the bodies and lives of those close to them. Tattoos have been used as markers of association for probably as long as human beings have walked the earth, to mark tribal affiliations, regimental membership in the military, membership of fraternal orders such as the masons or US college Greek letter groups, and to signify gang membership. 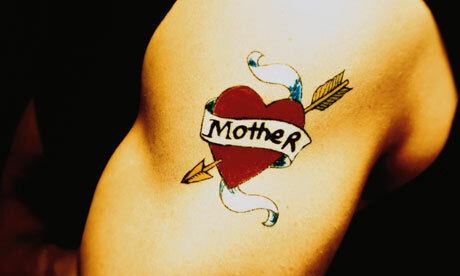 The most common of these types of affiliative tattoos, though, is marking an attachment to a loved one. There's an old adage in tattooed circles that suggests getting your lover's name tattooed on you is a sure kiss of death for that relationship, and it's an old gag too: Norman Rockwell's famous 1944 Saturday Evening Post cover painting, The Tattooist, shows a salty sailor in the tattooist's chair, having yet another name added to an arm already full of the crossed-out names of past paramours. Even earlier, a cartoon in Punch from 1916 shows a "fickle young thing" – a well-turned-out young woman, as it happens – revisiting her tattooist to seek an amendment to the ornamental crest tattoo on her arm as she has, euphemistically, "exchanged into another regiment". None of this seems to have affected the long-standing popularity of having names or symbols tattooed to commemorate couples' love and bond. Magazines in the 1920s reported the latest fad for newlyweds was getting matching tattooed wedding rings; preserved tattooed skins in the Wellcome Collection from the late 19th century feature names and portraits of lovers; studies of tattoos in the American navy in the 18th century reveal a large percentage of seamen of the period bore tattoos of the names of women; even Christian pilgrims in the 16th century were recorded to have borne the names of their wives on their skins, as tokens or identificatory marks; and records attest to romantic tattooing even in ancient Rome – St Basil the Great (329-380) is said to have condemned the tattooing of a lover's name that he observed on someone's hand. While I'd certainly never advocate getting a permanent mark of your relationship too hastily, it does seem that the instinct to inscribe a permanent token transcends the ages. Caveat amator. Single tattoos that span multiple bodies appear to be a more recent phenomenon, however. In 1977, New York-based tattoo artist Spider Webb undertook what was probably the first conceptual art project to use tattooing, in a piece called X-1000, in which he tattooed single, small Xs on to 999 individuals, and, as a culmination, one large X on the final, 1,000th skin, conceived as one contiguous work. This tattoo, potentially spanning thousands of miles at any one time, was, Webb said, "the largest tattoo ever done at any point in history". In 2000, as the culmination to a performance art project begun in 1998 designed to highlight the horrific lives and plights of the homeless and hungry in Mexico City, Santiago Sierra produced his piece 160cm Line Tattooed on Four People, a single black line tattooed across the backs of prostitutes in exchange for wraps of heroin, as a symbol of their desperation, interdependence, and utter powerlessness. Sierra would later remark: "You could make this tattooed line a kilometre long, using thousands and thousands of willing people." In 2003, author Shelley Jackson famously published her short story Skin on the bodies of 2095, one tattooed word per person. These tattoos bring together strangers in common cause. My favourite set of matching tattoos, though, are probably the ongoing collection of work worn by twins Caleb and Jordan Kilby, tattooed with matching work by influential and extraordinarily talented New York-based artist Thomas Hooper. If you must get matching tattoos with someone, it's wisest to pick someone whom you cannot break up with or divorce, and to get the work carried out by a tattoo artist who will produce a piece of work that will stand the test of time on its own terms.